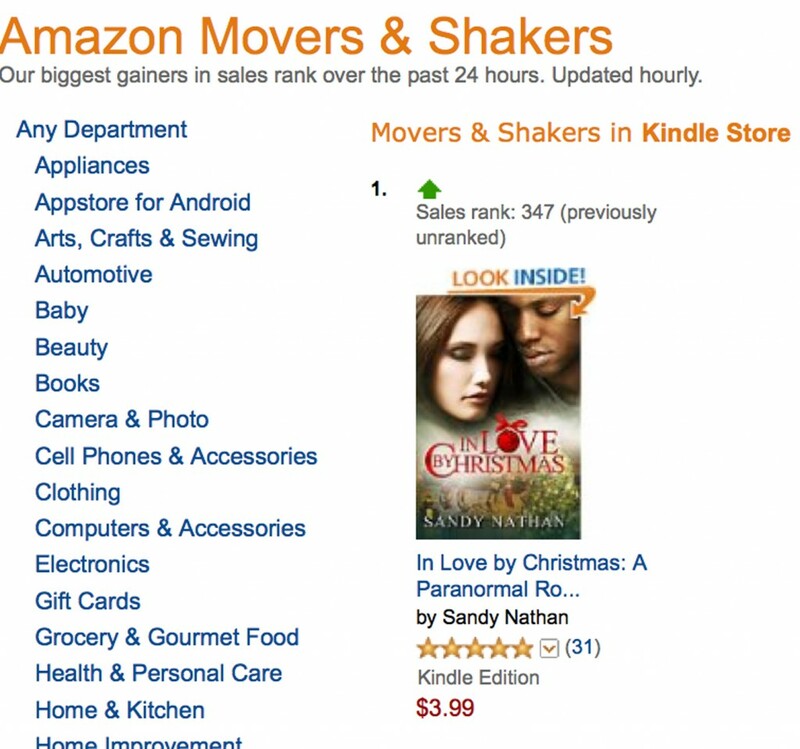 In Love by Christmas is a #1 Amazon Bestseller in Metaphysical Fantasy! What a day! Authors don’t have many days like I’ve had today. I’ve read about the joy of being a bestselling author and having a #1 bestselling book, but today I’ve experienced having them. Being a bestselling author and having the book is MUCH MORE FUN than reading about the experience. The really top-selling independent authors have shared their selling techniques–Cheryl Kaye Tardif, Joanna Penn, David Gaughram, and John Locke, to name a few. They talk about using the days you’re allowed to give your Kindle books away free on Amazon as springboards to huge sales afterward. I’ve done the giveaway part very successfully before, but it’s never carried over into the paid part, the way the marketing books say it should. This time it did. So I can post what follows. But first, let’s give credit where credit is due. Thank you, my readers and buyers, for your support of me and my work and for buying In Love by Christmas. Without you, none of the below would have happened. I thank you from the bottom of my heart. I hope that In Love by Christmas knocks off your socks, rattles your brain, and shakes up everything in between. I consider that the least I can do in performing my job as an author. Note that cute little orange tag to the right of the book’s name. It will carry that with it forever. It’s a #1 Bestseller. On Amazon, in the Metaphysical Fantasy category. More good things happened. It was like winning the Holiday grab-bag at Weight Watchers–I did that yesterday, too. What a haul! Woo-hoo! Amazon Movers & Shakers are the books that have shown the greatest jumps in sales. So there we were, Leroy, Cass, and I tottering on top of the book cover, Number 1 Mover and Shaker on all of Amazon. For a while. These things change every hour, but I can say that I got more than 15 minutes of fame. It was almost twenty-four hours in this spot. Amazon has a new program of ranking authors. In Love by Christmas's stellar performance got me a ranking. Here I am: It's not number 1, but it's better than I've been able to do writing and publishing since 2006. Just like the Bestselling title goes with the book, so does the rank go with me. More and more goodies, just like that Weight Watcher’s gift box. Truly, I can’t say which was more fun, though that’s probably because I haven’t gotten the dinero in my paws yet. I’m tickled about the categories where In Love by Christmas shows up. First, my heart and soul are in Metaphysical and Visionary fiction. I started writing to change the world. Save it, if I could. I haven’t succeeded too well, if you follow the news, but my goal hasn’t changed in the eight or nine books I’ve written. I write more flamboyant stories, perhaps, but their roots are in my visionary experiences and spiritual life. Long ago, when the Bloodsong Series was forming within me, I had an explosive spiritual experience which put several of the books in my brain in an instant. Native Americans were an integral part of that experience. Writing the books of the Bloodsong Series, all of which feature Native Americans, has changed my life. Leroy Watches Jr. has also changed my life. He is what used to be called a black Indian: his roots are Native American, African American, and Caucasian. His experience is different than that of many of my characters. He talks about it in In Love by Christmas. Or lives it, more. In Love by Christmas is a multicultural and interracial romance. It’s a beautiful love story that transcends race, but doesn’t ignore it. Leroy will tell you about it in the book. You’ll see them all below. At one point, In Love by Christmas was top rated or close to it in eleven categories. I’m mind-boggled. And now, In Love by Christmas is ranked in all those categories. Thank you, buyers and readers! In Love by Christmas was ranked in a total of eleven categories. How about a present for those of you who have read this far? A MOVIE! Here’s a video of our hero, Leroy Watches Jr. as he begins his search for his soul mate. 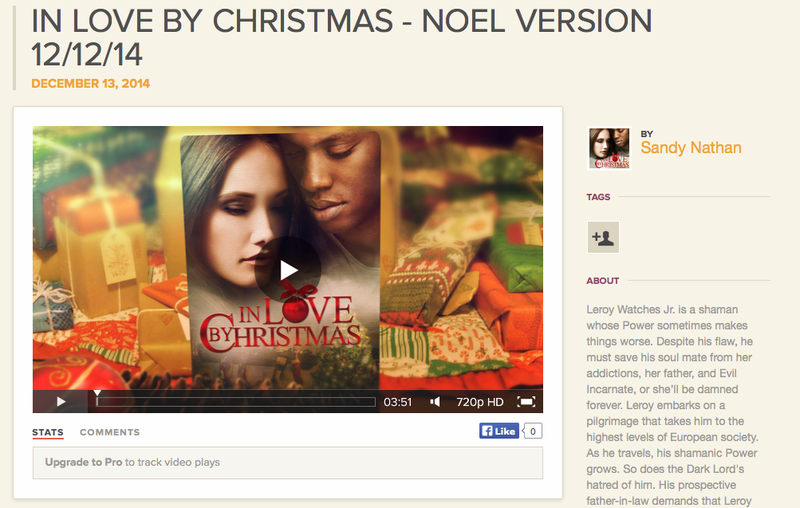 IN LOVE BY CHRISTMAS: A PARANORMAL ROMANCE – Noel – Montreal Version + from Sandy Nathan on Vimeo. Leroy Watches Jr. is a shaman whose Power sometimes makes things worse. Despite his flaw, he must save his soul mate from her addictions, her father, and Evil Incarnate, or she’ll be damned forever. Trying to unite with his true love, Leroy embarks on a pilgrimage that takes him to the highest levels of European society. As he travels, his shamanic Power grows. So does the Dark Lord’s hatred of him. His prospective father-in-law demands that Leroy and Cass be in love by Christmas. Can they be? Your Shelf Life, my blog for authors and readers. Oh, that’s where you are! I’ve been grappling with Animoto.com all day, trying to produce a really good video for my new Christmas paranormal romance In Love by Christmas, also known as ILBC. I did create such a video. I produced about twelve, all sightly different. Different music, theme, words. I also fixed typos on the videos I’d just made and the ones I produced yesterday. As you know, typos multiply any time you take your eyes off your text. God knows what goes on on my hard-drive or in the cloud at night. Typo frolics of a reproductive kind. Despite this, I really like Animoto.com as a way to make book videos. I can use their technology and produce stunning results. But PLAYING videos from their site … I don’t like so much. Those files hit so many snags they might have been using some of my old pantyhose as a power source. Takes so long to play a vid that even my MOM wouldn’t hang in there. My web guy, Don Herion, suggested hosting my videos on Vimeo or Smugmug, as faster, higher quality places to mount my results. I tried Vimeo and found that it had superior play back to Animoto.com’s , but NOT superior enough. My MOM would lose interest after the second stall, plus all that jiggling made me dizzy. So I got on Smugmug and signed up for their free trial. Yesterday. If you hit that link in two weeks, it may not exist, as will be explained below. Smugmug gives you this amazing website, all yours, if you can figure out how to use it. It’s very chic and stylish, design-wise, which means that if there are any controls for the site, I can’t find them. So, I won’t sign on for more than the free two weeks unless I make amazing progress in the cyber dimension. If a 69-year-old woman with two advanced degrees can’t find the friggin’ controls in two weeks, it’s not worth paying for. Although I seem to be rambling, I’m writing about the elderly and technology. Did I mention that my husband got not only a brand new iPhone 6+, but a new Apple laptop to go with it? GO BARRY! After a week, he can competently answer the phone, without dropping the device from his belt holster. Today, he was working on ANSWERING EMAIL with his new laptop. This afternoon, we practiced the New Intimacy: he sat at one end of our family room with his new toys while I sat on the other end with my sturdy 27″ iMac, attempting to produce the perfect video for In Love by Christmas, or ILBC, as I may have said, perhaps several times. I did make several, if I could remember which ones were the good ones. Also, I somehow erased the vids I’d previously sent to Vimeo and to Don Herion, my web guy, to post on my website. So those are all screwed up, as is the video embeds and locations I sent my publicist. This is really important, because THE BIG PUSH starts soon and he needs to get the visuals out there. This is how the front image of "winning vid" for ILBC looks on my Animoto page. This is how people relate in this new age. Sort of like sitting on opposite banks of a river, throwing electronic tomatoes at each other. Basically, technology for those over sixty is dicey. Even for younger people, sometimes. I believe the cyber age responsible for the degeneration of our social order, which isn’t saying much. You’ve been out to dinner and looked at the next table, to find everyone on his or her smart phone. You’ve shaken your head and tskked sadly, until you got a text you had to answer. The the problem is not technology, it’s learning how to use it. Every family should be assigned a 12-year-old from the local elementary school to teach the elders how to at least get to the gaming apps. That’s only right. Meanwhile, here’s the vid I made on Animoto, transposed to Vimeo. You should be able to watch it easily by clicking appropriately, though it may stutter a bit the first run through. The Smugmug version will take me longer to post. I have to find the controls. So, I did produce the #@^!! video. I’m not saying that the elderly can’t do tech stuff. We can. We may simply use unseemly vocabulary for long periods while doing it. This is not a sin. 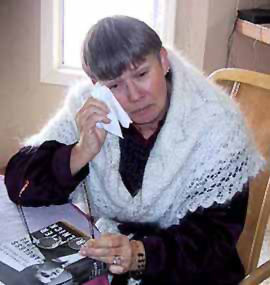 Old folks have feelings, too, and need to express them. Sometimes, %&*%#!! isn’t enough. But it was today. Enjoy the video. Next time I’ll tell you about making Christmas presents for your loved ones using the graphics of your book covers. This is not as easy as it sounds, even given the plethora of companies promising the mouse pad of your dreams, or your hubby’s dreams. (Or porcelain mugs, my particular weakness.) That’s another story. 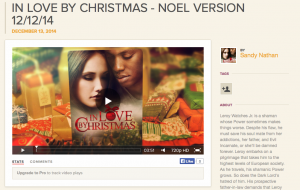 IN LOVE BY CHRISTMAS – NOEL VERSION 12/12/14 from Sandy Nathan on Vimeo. Leroy embarks on a pilgrimage that takes him to the highest levels of European society. As he travels, his shamanic Power grows. So does the Dark Lord’s hatred of him. If that doesn’t work, this link to the video on Vimeo will. My Thanksgiving Gift to You – Let’s Go to the Movies! Lil ol’ me, myself, and I, on Animoto. I learned to use Animoto years ago. They deliver incredible quality and I can DO them. I load my images on the Animoto site, select the video style I want from Animoto’s menu, pick music from their library, add text, and push a button. Animoto’s clever computers do the rest. If I don’t like what I get, I push the button again. Voila! Instant genius that even an almost-seventy-year-old grandmother can master. My Thanksgiving gift to you is a recap of my writing of 2014. You may not know about everything I published this year. The books are interconnected. Free-standing, so you can read just one and get the story, but they are a family. Grab some popcorn and enjoy the show. THANK YOU! THANK YOU! THANK YOU! For your support and patronage in 2014. I appreciate it with all my heart. Much more is in the pipeline for you in 2015 and future years. The only problem with Animoto on my computer is that sometimes it’s balky replaying videos. You probably have to play it through once to buffer. We may have the problem because we live out in the country, where ground squirrels carry the images across the fields in their mouths. They are a little slow, especially after large meals. My Computer Guy said to counter this by using Vimeo. (This is my Vimeo account. See ALL my vids!) I’ll attach the Vimeo version, in addition to the Animoto . Thing is, sometimes it’s balky, too, and it stutters. It’s right below, followed by the Animoto version. The combined show is probably enough to make the ordinary computer explode with excitement. You, too, I hope. I LOVE TO SEE YOU SMILE – A THANKSGIVING GIFT FOR MY READERS + from Sandy Nathan on Vimeo. Happy Thanksgiving! This is a day and season for gratitude–and for telling people how much they mean to you. Readers, you mean a very great deal to me. I love to see you smile and I’ll do my darndest to keep you smilin’.